All of the children were fortunate to have a dinosaur come to visit us at Ashton Keynes as part of Class R’s topic work. Class R and 1 were able to meet baby Jack, a small but rather nippy dinosaur, and Millie a rather larger T-Rex! 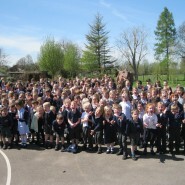 The whole school were able to meet Millie on the playground and what an amazing creature she was!